Sukhoi's highly regarded aerobatic aircraft have won numerous international aerobatic events. Sukhoi is perhaps better known as one of the two preeminent Russian high performance combat aircraft designers, but it turned its attention to design and flying a single seat aircraft for unlimited aerobatics competitions in the early 1980s. 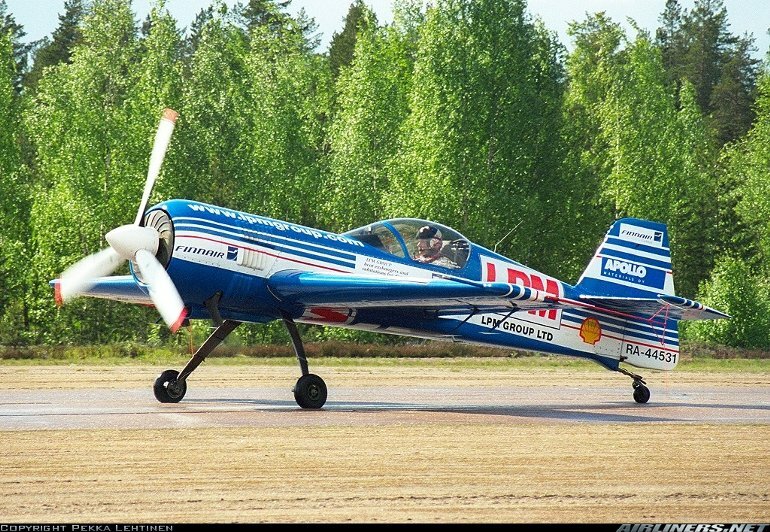 The prototype of the single seat Su26, the originator of the series, flew for the first time in June 1984, and remarkably competed in the World Aerobatic Championships held in Hungary only two months later. Features introduced on the initial Su26 include the Vedneyev, now VOKBM, M14 nine cylinder piston radial engine, which is highly regarded for its simplicity, power to weight ratio, fuel economy and low oil consumption. The airframe itself is extremely strong, capable of withstanding +11 and 9g, while the wing's aerofoil section is symmetrical and attached to the airframe at zero incidence and dihedral for similar positive and negative angle of attack flight characteristics. Modifications to the Su26 including a squared off vertical tail and less glass led to the Su26M, which participated in the 1986 World Aerobatic Championships in the UK. The Su26MX is an export version. The success of the Su26 led Sukhoi to design a two seat, dual control development, the Su29, which first flew during 1991. Differences include the second seat, greater span wing and increased length. The Su-29M has lightweight ejection seats. The ultimate development is the Su31, which first flew in June 1992 as the Su29T. The Su31 is a single seater based on the Su29 but with a more powerful engine. The basic version is the Su31T, the Su-31X is for export and the Su31U has retractable undercarriage. Production began in 1994. Su29 - One 265kW (255hp) VOKBM M-14PT nine cylinder radial piston engine driving a constant speed three blade propeller. Su31T - One 295kW (395hp) M14PF driving a three blade constant speed prop. Su29 - Max speed 325km/h (175kt). Initial rate of climb 3150ft/min. Service ceiling 13,120ft. Range with max fuel 1200km (648nm). Su31T - Max speed 330km/h (178kt). Initial rate of climb 4725ft/min. Service ceiling 13,125ft. Range with internal fuel 290km (155nm), max ferry range up to 1200km (648nm). Su29 - Empty 735kg (1620lb), MTOW 1204kg (2654lb). Su31T - Empty equipped 670kg (1480lb), MTOW 968kg (2134lb). Su26M - Wing span 8.20m (26ft 11in), length 7.29m (23ft 11in), height 2.89m (9ft 6in). Wing area 12.2m2 (127.0sq ft). Su31T - Wing span 7.80m (25ft 7in), length 6.90m (22ft 8in), height 2.76m (9ft 1in). Wing area 11.8m2 (127.0sq ft). Accommodation for pilot only in Su26, Su26M, Su31T and Su31U. Seating for two in tandem in Su29. Production includes approximately 60 Su29s, 70 Su26s and 25 Su-31s.